Ready for a tree top challenge?! This adventure is a memorable zipline experience. 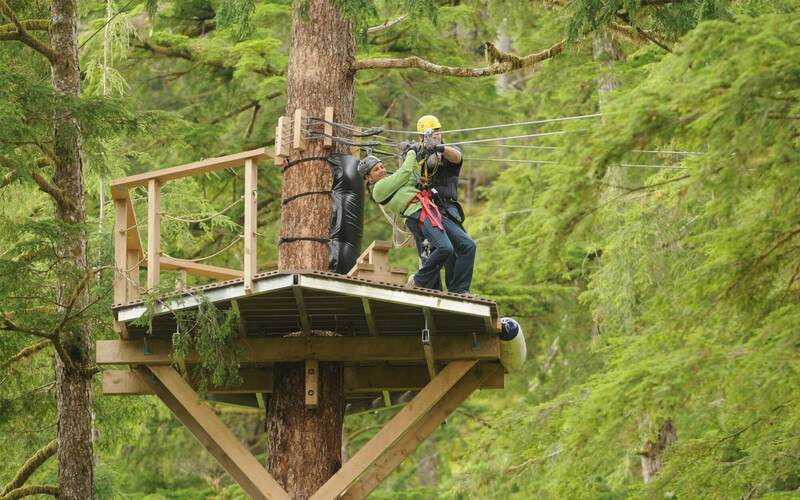 Plan to fly through the Ketchikan rainforest on this tree top zipline adventure. 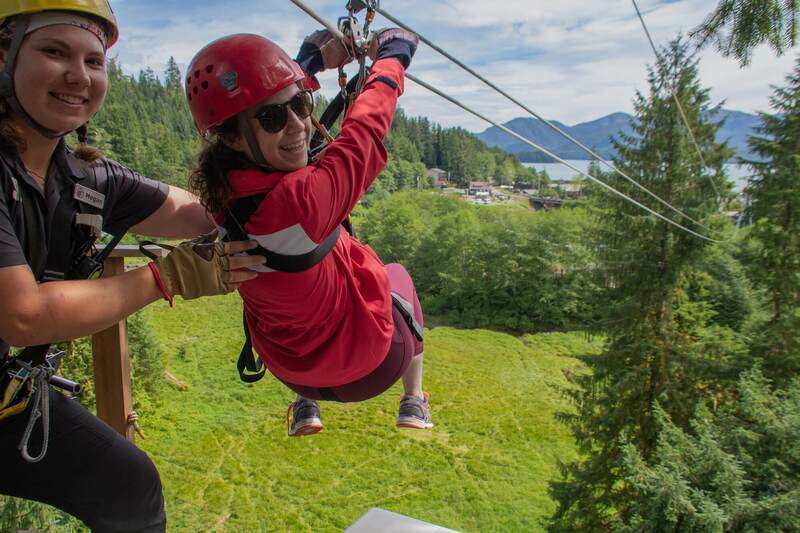 This course is designed for people who are looking for an adrenaline rush, love ziplining, or want to step up to new challenges like skybridge suspension bridges and rappelling. Imagine yourself gliding through the top of a rich rainforest canopy along a series of eight cable zip lines. 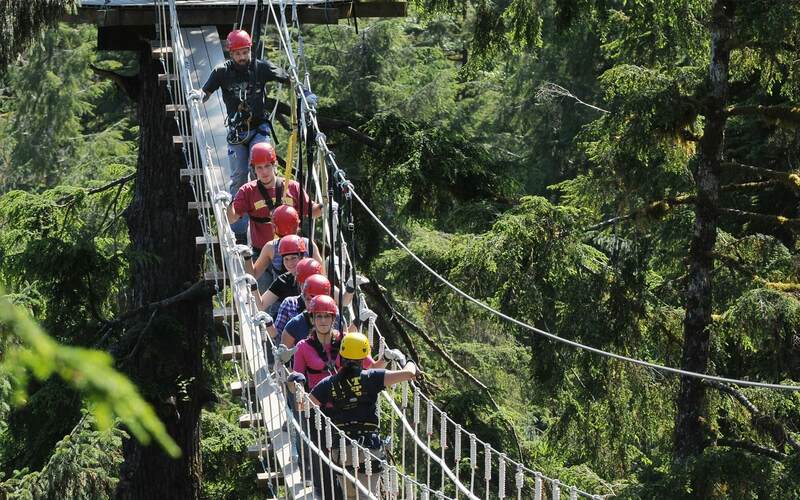 You’ll be zipping along the border of the magnificent Tongass National Forest, navigating three aerial bridges suspended among spruce, hemlock and cedar trees. This Ketchikan rainforest reserve is home to one of Alaska’s richest salmon spawning streams and a pristine inter-tidal estuary. The area is a rainforest sanctuary, home to a high concentration of bald eagles, black bear, and a variety of other species. Here’s how you’ll ride, glide, and rappel along the way. The tour starts at the downtown dock with an eight-mile narrated coastal drive to Herring Cove. 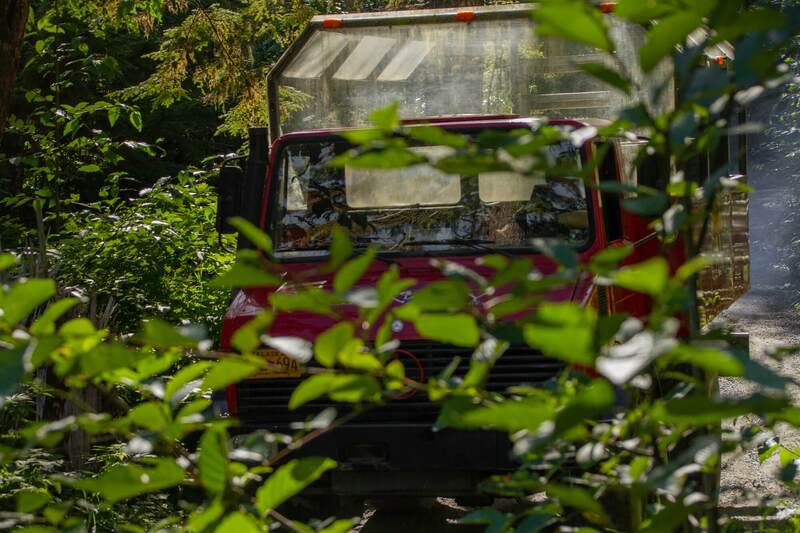 An all-terrain custom 4×4 Unimog will pick you up at Herring Cove, transporting you up a steep rainforest hillside to the canopy chalet. You’ll meet professionally trained guides who will outfit you with sophisticated safety equipment and give you a detailed orientation prior to zipping from the first platform. Your tree top zipline adventure features a flight over eight ziplines and three suspension bridges, looking out on beautiful nature trails. 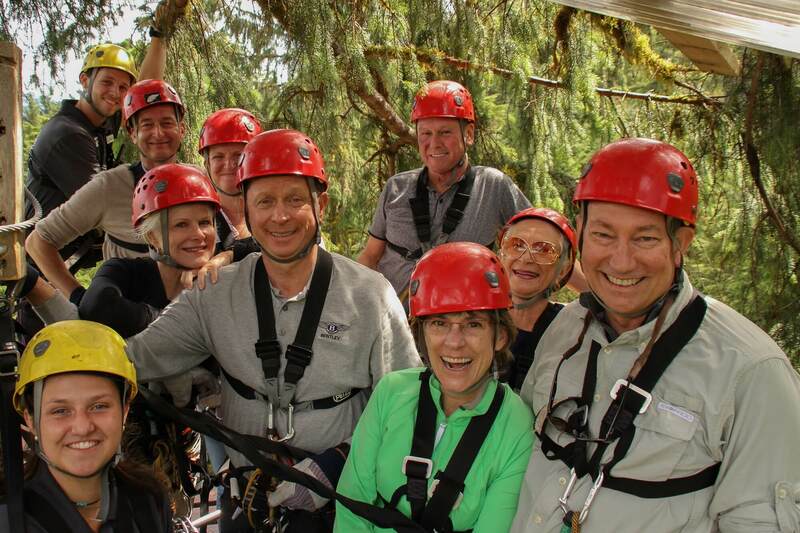 Your guides will progressively ease you into the forest canopy along cables ranging from a short 100 foot to the 750 foot pulse pounding “Ben’s Revenge”. Throughout this award-winning adventure you’ll be surrounded by the sights and sounds of the rainforest wildlife reserve. There is so much to see from the tree platforms, including spectacular panoramic views and possible wildlife sightings. You’ll fly over a cascading creek and lush forest, and cross three hanging sky bridges – all giving you breathtaking views of the forest 135 feet below. The final zipline emerges from the rainforest and transports you over lush grassy wetlands to a viewing tower, 55 feet above ground. Here you’ll rappel to the ground and gear-down at the base camp. 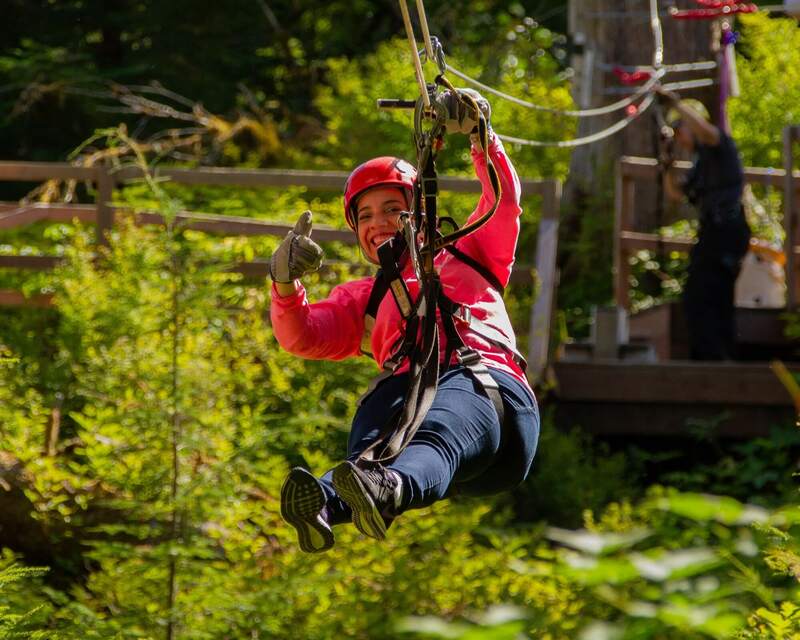 Stop by the General Store, where you can see the pictures taken during your zipline experience, picking out the ones you’d like to buy and shopping for mementos of your Alaska adventure. 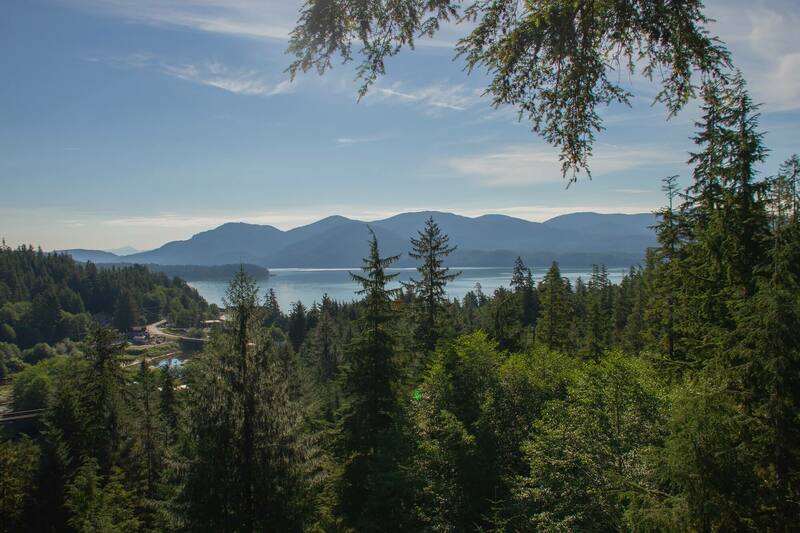 Before you head back to the dock have your camera ready as you explore the totem park, historic sawmill, watch blacksmith at work and see an eagle up close at the Alaska Raptor Center exhibit. And off you go, full of awesome memories. Please Note: Minors must be accompanied by an adult. Participants who do not have full use of limbs, suffer from neck or back issues, have mobility limitations, women who may be pregnant, or those with seizures and similar disorders should obtain medical advice and release from their physician prior to participating. In addition, please contact our staff 48 hours before your arrival, if you’ll need any special accommodation to safely enjoy the ride. A rain jacket is provided, if needed. Closed toed shoes are required. Long pants and layered clothes are recommended. This experience involves active participation over an extended period of time. Participants should be adventurous and in good physical condition. We saw a momma bear and her cub below us! This is great fun! Not hard and even though I am not a fan of heights or speed I enjoyed the tour thoroughly. Collin and Kelly kept us (a family of 6) in the know and ready to go. We all loved it. Don't miss it! Collin and Anthony were terrific! The day was worth it from start to finish. Our guides were first and foremost concerned with safety, so I never felt any unease. Anthony and Collin are very funny and creative which made it even better. They work together as a great team. I'm sorry I didn't get the name of our photographer, he was very fun as well. 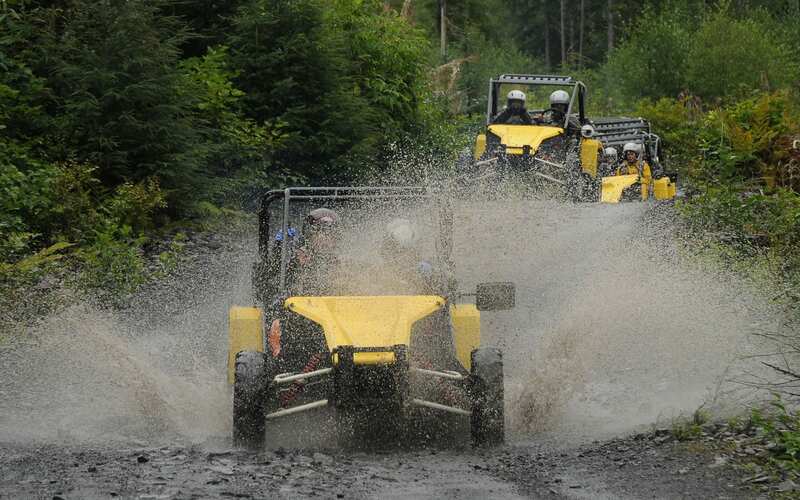 This was one of the best excursions during our visit to Alaska. It was a great time..... Don't miss it! Our guides were Ben and Court, they were fantastic. Ben is like the Kurt Vonegut of zip lining. He gives excellent inspirational speeches as you go along, (mostly to kill time while waiting for your turn). We were pleasantly surprised to find an animal sanctuary at the end of our tour, plus hot chocolate! All in all, and amazing experience! 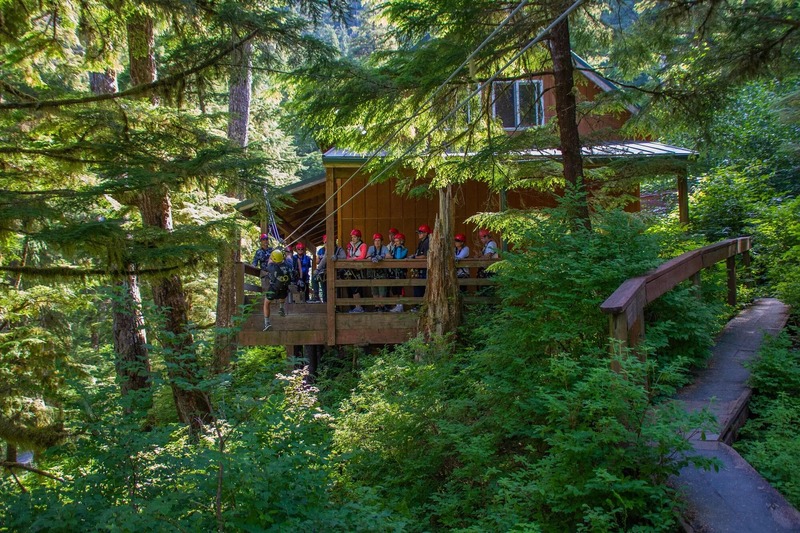 Explore the Tongass Rain forest via a flight across 7 zip lines, 3 aerial bridges and exit by rappelling down from last platform. Bouncy, peppy Emma and youthful, college student, but seriously competent, Chris transport you in a 4X4 Unimog to the mountaintop outfitting shelter where you are fitted with safety and rain gear – yes Ketchikan enjoys (?) 200 inches of rain/year and it rained all the time we were on this eco-adventure. 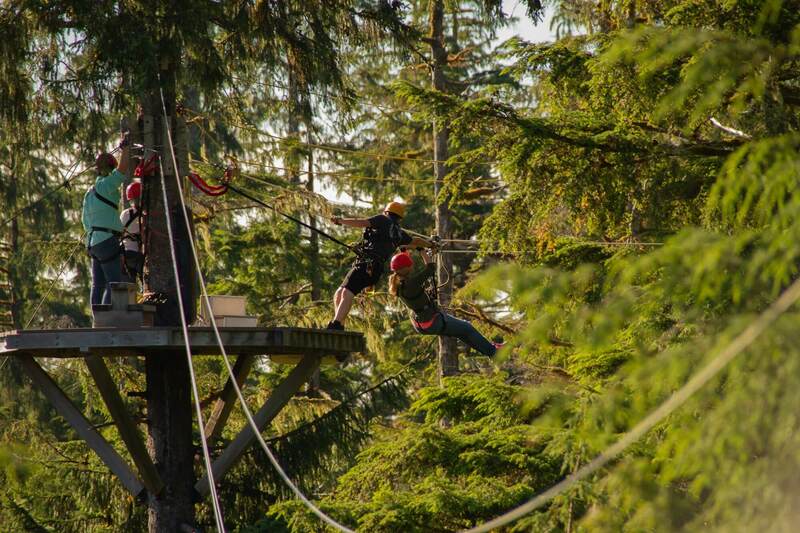 From 135 feet above the forest floor, you traverse zip lines ranging from 175 feet to the 850-foot pulse-pounding “Ben’s Revenge.” Treetop platforms and 3 hanging sky bridges offer breathtaking views of the forest and wild black bears may be seen “fishing” during salmon spawning season. Upon completing this eco-adventure, you receive a lovely recognition medal and Diane warms your heart/body with hot chocolate, coffee or tea and a tasty salmon cracker snack. Well worth the cost and more interesting than most other zip line venues including Costa Rica, etc. I don’t like heights, but this is a must – Must – MUST – do! It's sort of terrifying, trying to find your feet on the platform after sailing from tree to tree, and hugging the trunk with six other adults until it's time to go again. Oh, and don't look down. But seriously, this experience was among the best of my life, especially because I was accompanied by my husband and three grown sons. Our guides, Sam and Mackensie, were so encouraging, so fun, so professional, and we felt totally safe (well, maybe not when we were walking across the suspension bridges). Go. Request them as your guides. Buy the photos they take of you at the end. You won't be sorry.